Should We Just Use Venmo? Yesterday, PayPal agreed to pay customers $15 million for ripping them off over the past few years. After I wrote about it, reader horror stories started flooding my inbox and comments. I made a five dollar purchase on my steam wallet with my PayPal account one day. Unbeknownst to me, PayPal had “magnanimously” given me a credit line and made that credit line my default payment account. Five months later, I got a call from a collection agency. I was “over 90 days past due on my account,” according to the man on the phone, and I had to pay now. Well I called Paypal to explain that I didn’t even know I had a credit account. They would not refund my money or wipe away the late fees. Approximately 10 days ago I received an email from PayPal that my account was limited.Thinking this may not be a very good thing but nothing alarming, I called them to see what limitations and why. It turned out that my account is completely shut off and I no longer have access to the $2200 I happened to have in my account. How? “Your company, Florida Thunder, is an adult oriented company and we are a family oriented company” -came the answer. It’s clear that we sell tickets to male revue shows and we’ve been doing that for the last three years with out a smudge on our record. Any female customer service agent I have had the displeasure of talking to, has been treating me like some piece of dirt. I do not know what type of memos or remarks they have on our account but I have always spoken to every single agent with full respect. One of them started arguing with me that they have 16 and 17-year-old kids who have PayPal account, that don’t need to see what is displayed and presented on our website. There is not a picture on our website that even a five-year-old kid would not see at their local beaches. PayPal will not give me access to our funds for 180 days. They claim that it is written in their terms and conditions. I tried buying a book online($25) roughly three years ago. It required me to use PayPal for the purchase, so I followed the steps to fill out my personal information, but after clicking the button to go to the next screen (I assumed this is where I would fill out credit card info), it told me I had successfully signed up for Bill Me Later. I remember being very confused because I’ve purchased items many times online but had never been instantly signed up for anything. I emailed PayPal and got an automated, non-helpful response. 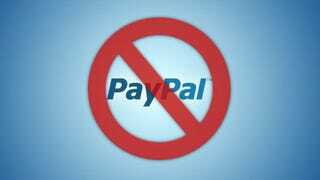 I tried to pay the bill immediately, but PayPal simply would not accept my online payment. It required me to fill in the “Name of my bank” but would not accept ANY of my answers. I use Chase Bank, so I tried every possibility, even ‘JP Morgan Chase Bank’, etc. I told myself if they didn’t want my money, then it’s not my problem. I got a call maybe a month or so when my account was “past due”. I now owed over $50 at this point. In 2006, I sold a cell phone on Ebay and the payment was processed through PayPal. The buyer, according to PayPal, filed a fraud report with them stating that the item was not received. PayPal reversed the payment and said I owed them the money for the item. I contacted the buyer and verified that they received the item. I also had confirmation from them that the item was in fact received. I tried to provide this information to paypal, but they refused to look at it or look into what I was telling them. I asked them at the time if I could file a counter fraud report and I was told no. Fast forward 9 years. PayPal aquired Bill me Later last year (I believe). Well they officially change bill me later to PayPal Credit and because of the unpaid fraud report from 2006, paypal locked my previously up to date zero balance account with what was bill me later. I received no notice about this it just happened. I called paypal about this and went through about every person I could speak with about the issue. At the end of the day they said I would not be able to use my Bill Me Later/PayPal credit account until I paid the outstanding balance. But here is the kicker, the manager said that I could have filed a fraud complaint in 2006, but now it was too late. He said this to me and he could see my correspondence with them by email in 2006, where I asked about filing a complaint. To that amount, add the $426.00 and, I end up paying $2,026.00 yearly (over 50% of the loan). I tried to cancel the PayPal Loan but their representative told me I will still be charged the 10% every 90 days for one year. I have not used one penny of said loan and yet PayPal still takes a daily amount from my account to cover their 10% interest every 90 days. I had two cards on my account, an American credit card and a Canadian credit card. I went to an American site and charged it to my American card at PayPal. PayPal charged my American one and my Canadian card, and since it was in American, I was charged an exchange rate for the charge. PayPal did not recognize that this was there problem, they suggested that I inquire with the seller. How is it there problem, I asked. They didn’t answer. I have never got my money back. I paid twice for this purchase. I recently sold a phone on eBay. After a long process of someone wanting to return the phone to me, and then them not returning the phone, my money was held by PayPal for around 6 weeks in total. Now my funds are available after eBay accepted that I should have my money back. However, now PayPal won’t let me add my bank account to withdraw the money. I’ve tried contacting them on multiple occasions with no success. People reply on social media, but they say I’m in a queue but still no reply. Even when I access the customer service page it says it’s currently unavailable.It’s £120 which is just sitting there with them earning interest on and not willing to give me the money! I can’t afford to not have that money. I’m literally living off the last items in my cupboard and unable to buy food. I’m having to turn to family to borrow money. I sold 2 tickets to an event for $550 total and sent the tickets electronically. After the event was over, I got a notice from PayPal that the buyer issued a chargeback and got refunded the full amount, which was taken out of my account. I emailed the ticketing agency and they confirmed the tickets were indeed scanned and used at the event. The buyer was of course non-responsive, and enjoyed the event at no cost. I, on the other hand, got nothing in return, even after submitting all proof to PayPal and reviewing with them over the phone. They agreed with my claim but could do nothing about it. What’s to stop anyone from doing the same thing as this buyer? PayPal said nothing. I sold a Macbook on eBay with signature required. The buyer signed for it and then claimed it was never received.It was sent to a confirmed address and USPS insurance refused my claim because it was signed for by the addressee. Turns out he actually had the SAME Macbook for sale on eBay while claiming he never received it (I know because of a distinct scratch evident in the photos.) PayPal’s response to my original pics and his on the ad was enough to prove he got it right? Nope charged me back and sided with him. I closed my bank account immediately and PayPal still calls me every so often threatening to report me to Equifax.